(12-07-2017 12:59 PM)pier4r Wrote: @massimo. Only 144mm ? That's is a golden god! I confess I didn't check since I finally had my unit. Did it right now and, yes, those figures are correct. Still produced calculator with formula entry (and SOLVE)? No one available now - as I know. As seems to me the currently available calculators are made for students, because this is the only market, where calculator manufacturers can to sell their products. If they want their calculators to accept on exams they must to reduce its capacity. Therefore no alpha, no equation entry, no programmability, no any which makes these units useful. But: I found CASIO fx-3650P and fx-50F and its successors which are programmable scientific calculators. They have very limited memory, no SOLVE, but you can write your own programs. These units currently the best what available on the market and still production. If you do not want to pay for it lots of money select the perfect clone SENCOR SEC103. This is (in Hungary) under 10.- USD and totally same as fx-3650P (the fx-3650P approx. 45.- USD from webshop). Maybe I was not clear . For me a solver is a plus , it is not strictly needed. Although I think that if a sharp 506w has a minimum solver , even other models can have it. (12-09-2017 12:06 PM)pier4r Wrote: Maybe I was not clear . For me solve is a plus , it is not strictly needed. Although I think that is a sharp 506w has a minimum solver , even other models can have it. No, you was totally clear and I was not. a.) The students are not professional users and for students must to produce a "good but not professional" equipment - which are accepted on exams. b.) The professional users (like engineers, scientists, etc...) do not selects "good but not professional" equipments - because they have experience and they can decide which calculator is perfect for him/her. 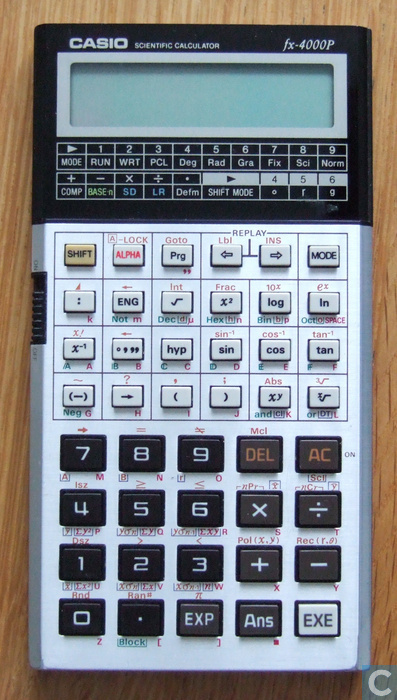 A practicing engineer will be select a good calculator from 80's with solve and programmability, lots of memory. 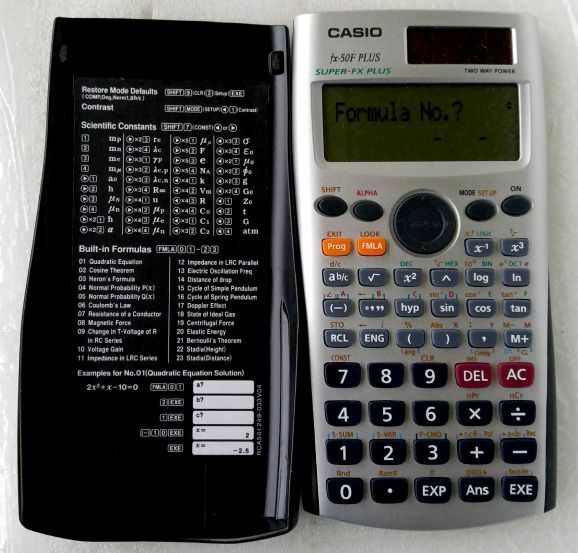 The ideal engineering calculator: like 15C in 32S house with functions of 48GX and memory and backup capacity of 50G. The Casio fx-5800p do not depend on the battery to maintain the memory contents, as it stores the user data on flash rom. See page E-136 of the user manual. "Our calculator uses flash memory to store data, so memory data is not lost when you remove the battery." interesting! Does the 35S, dm42 do the same? And others? I can tell for sure that the sharp models lose the memory if one is too slow with the battery change. (12-14-2017 04:07 PM)pier4r Wrote: interesting! Does the 35S, dm42 do the same? And others? The 35S will lose its contents if you remove both batteries at the same time. They are connected in parallel (with a pair of diodes to ensure one battery doesn't feed into the other), so you remove and replace one, then the other, and your data stays intact. The DM42 only has one battery. What you can do is save the machine state to flash memory then replace the battery. When you switch it on and if the battery was out for long enough for the machine to "forget" its contents, you can re-load it from the state file saved previously. So, the answer to your question for the DM42 is "yes, kind of". You have to save the machine state to flash, it won't do it automatically. The reason for the manual nature of this step is because you can save multiple state files that each include different "virtual machines" for different applications, eg. a state file with "financial" programs and data, a different "engineering" state file, a "programming" state file etc... You have to give the state file a name that reflects its purpose. Or you can feed it via USB, methinks. ... well, no, or you cannot unscrew the back and change the battery... what a pity. (12-14-2017 04:23 PM)grsbanks Wrote: The 35S will lose its contents if you remove both batteries at the same time. They are connected in parallel (with a pair of diodes to ensure one battery doesn't feed into the other), so you remove and replace one, then the other, and your data stays intact.
? You can remove the back cover and then connect the USB cable. Exchange the power cell. Just did it, it works! (12-14-2017 06:15 PM)Massimo Gnerucci Wrote: Or you can feed it via USB, methinks. - Casio fx5800P ~ 25K of ram. - swissmicro DM42 (with a bit more effort to use programs as formulas). - swissmicro DM15 with registers and program memory (program as formulas) ~1500 bytes program memory. - Many sharp models have 9 memories and 4 formula memories. - Casio fx5800P: 6.4 x 3.2 . 6.22 or 6.4 is still like a big phone. My first programmable was a Sharp EL-5120 Solver. Very limited programming and formulas capacity (around 1200 bytes), but I have a special love for it. There’s also a model that has not been mentioned. It is the TI 67 Galaxy. It can store formulas and has 1,536 program steps. (01-04-2018 09:49 PM)badaze Wrote: There’s also a model that has not been mentioned. It is the TI 67 Galaxy. I have one of those too. It came out in 1992, 25 years ago, so is it still in production? That was one of the criteria set out in the original post. No it is no more in production. After this thread and the analysis of Dieter (in the same linked thread), I would lean more on the fx5800p rather than the 35s. Moreover the 5800p seems to have persistent memory (with the 35s one has to be careful to swap the batteries, as reported in this thread). This because the 35s and the fx5800p at the moment have prices quite close. Recap. For more info, read the entire thread and links in various posts. - swissmicro DM42 (programs as formulae). - swissmicro DM15 with registers and program memory (program as formulae) ~1500 bytes program memory. (01-05-2018 10:11 AM)pier4r Wrote: After this thread and the analysis of Dieter (in the same linked thread), I would lean more on the fx5800p rather than the 35s. Moreover the 5800p seems to have persistent memory (with the 35s one has to be careful to swap the batteries, as reported in this thread). This because the 35s and the fx5800p at the moment have prices quite close. Maybe OT to discuss aesthetics, but even if I think Casio makes some great calculators (and usually with better build quality and functions than TI), why do they to they have to make them so ugly? Casio used to make great looking calculators! 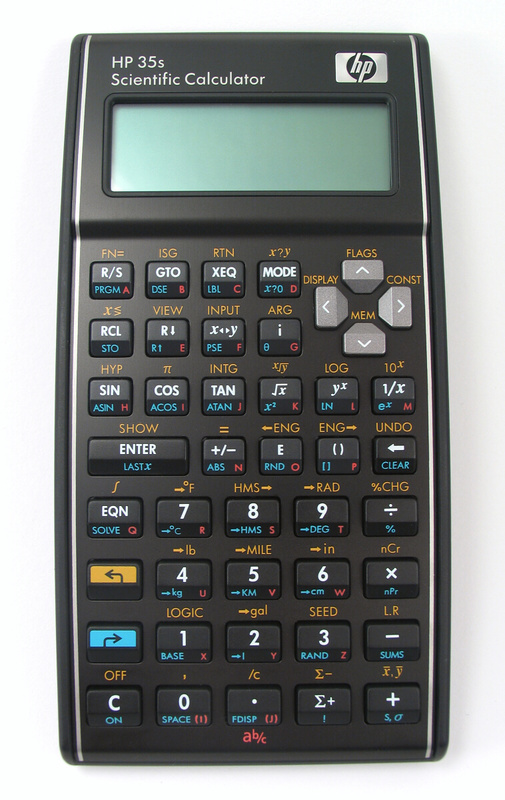 The HP-35S was given a bad rap by all the grumpy old men on this forum when it first came out, and yes, it had some bugs you could potentially run into, and it is a little wide for single-handed use, but honestly it's a great calculator and very affordable. I have a number of HP calculators from HP-45 all the way to HP-50g and I have found my HP-35S to be very much a "daily driver". I have one at work and one at home. My recommendation to everyone would be they get one while they can, because history has taught us that HP will soon drop production of them and instead of paying $60, they will be $600 on eBay. By the way, I have replaced batteries on both of my HP-35S calcs a couple of times (or more?) and never lost memory. My recollection is you have at least half a minute to slide the old battery out and the new one in, which is more than adequate time. (02-16-2018 06:13 PM)JeffJ Wrote: The HP-35S was given a bad rap by all the grumpy old men on this forum when it first came out, and yes, it had some bugs you could potentially run into, and it is a little wide for single-handed use, but honestly it's a great calculator and very affordable. I have a number of HP calculators from HP-45 all the way to HP-50g and I have found my HP-35S to be very much a "daily driver". I have one at work and one at home. My recommendation to everyone would be they get one while they can, because history has taught us that HP will soon drop production of them and instead of paying $60, they will be $600 on eBay. I agree. The 35s is far from perfect, but a great daily driver for normal needs! 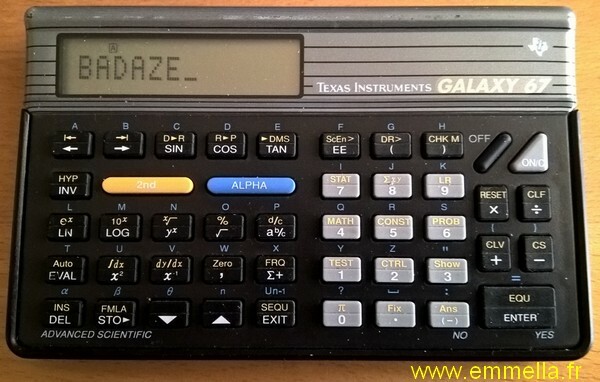 Probably the best calculator you can buy for the money today. TiP: Both batteries work in parallell, and you can easily without stress change one at a time (the calculator should be able to work on only one, but I have not tested that yet).